“Big things come in small packages” may be a cliché, but it couldn’t be a more true statement about Montpelier, Vermont. As the smallest state capital in the United States, Montpelier is a popular autumn travel destination because of its glorious fall foliage. However, no matter what season you visit this charming city, you will experience huge delight with its fun attractions, outdoor activities, and arts and culture. Walking around in Montpelier is easy and fun since it is a small, compact town. 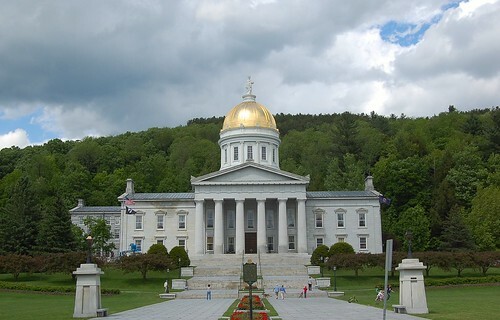 One of the top attractions here is the capitol building, the Vermont State House. With its distinctive gold dome, you can see the building long before you arrive at it. Set against a scenic background of a wooded hillside and manicured lawns, the building’s beautiful architecture is pleasing to behold. If you take the guided tour inside, you can view the gorgeous furnishings, carpets, stain-glassed skylights, portraits and historic artifacts. Open year-round, the Morse Farm Sugar Works offers free tours where you can see how sugar and maple syrup are made. Best of all, you can enjoy free samples at the end of the tour. Whatever you do, make time to visit the Farmers Market where you just might find a bargain among the fresh produce, flowers, herbs, baked goods and crafts. Situated in the middle of the city nearby hotel accommodations, Hubbard Park not only offers a picturesque setting for recreation and relaxation, but it also features a stone tower that you can climb to see beautiful views of the area. For arts and culture, Montpelier offers a number of pleasing options. Montpelier Mud is an art gallery presenting a collection of pottery sculptures and decorative pieces while the T.W. Wood Gallery and Art Center showcases many contemporary paintings and more. You can enjoy live performances at venues like the Lost Nation Theater and the Savory Theater. If your visit is during the summer, the State House offers free concerts on the lawn every Wednesday night. Additionally, you can learn all about Vermont’s history and culture through the award-winning exhibits at the Vermont Historical Society Museum. Montpelier’s beautiful landscapes offer adventurous and outdoor activities such as whitewater rafting and canoeing on the nearby Winooski River. At parks like Hubbard and North Branch, you can enjoy hiking, mountain biking, wildlife viewing and picnics as well as cross-country skiing in the winter. If your visit is in the summer, you can watch the Vermont Mountaineers play baseball at the Montpelier Recreation Field. Some of Montpelier’s best nightlife options include McGillicuddy’s Irish Pub where you can enjoy good food and watch sports. Popular hangouts like Charlie-O’s and Three Penny Taproom are good places to mingle with the friendly locals. If you love snow, Montpelier experiences frequent amounts during its long, cold winters. However, if you prefer warmer weather, you will find summers in the city to be quite comfortable. Spring and autumn in Montpelier offer pleasantly cool temperatures with beautiful shows of foliage. You can begin your vacation to Montpelier today by checking out the great hotel deals that are available at HotelDealSite.com. Whatever your budget or preference, you are sure to find a bargain.